Automakers resisted seat belts, air bags, clean car standards, and fuel economy standards. So it shouldn't have come as a surprise that automakers have come out in opposition to the Open Fuel Standard Act of 2011. But still, I am surprised. Announced yesterday, the major automakers said "they oppose a bill that would require nearly all vehicles to be capable of running on mostly biofuels." Capable of running on mostly biofuels? That's a strangely misleading way to describe the bill. They also said it would cost consumers more than a billion dollars annually. First of all, GM says it only adds seventy dollars or less to the production cost of a car to make it a flex fuel vehicle, and American car companies in Brazil say they don't charge any extra for flex fuel vehicles. And secondly, Americans paid $80 billion for oil in 1999. Ten years later we paid $900 billion. Why? Because we have no fuel choice. So even if it did cost a billion dollars, it would save us far more. The automakers' arguments against the Open Fuel Standard Act are either uninformed or deliberate attempts to deceive. 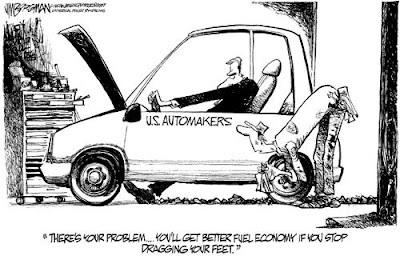 Automakers stated that most people with a flex fuel vehicle use less than a tank of ethanol per year on average. They said that the bill effectively imposes a tax on consumers "regardless of consumer demand and fuel availability." Eight million Americans have already purchased flex fuel cars knowing full well it would be difficult to find fuel stations selling ethanol but hoping more stations would open. And they have. The more flex fuel vehicles on the road, the more alternative fuel pumps show up. And it is alternative fuel's availability which is the main purpose of the bill. By mandating that cars will be capable of burning alternatives in addition to gasoline, fuel stations will have an incentive to provide ethanol and methanol to their customers. The purpose of fuel choice is to create competition at the pump in order to break up OPEC's harmful monopoly of transportation fuel. This is good for America's national security and economic stability. But automakers don't think it "makes sense." This is the same nonsense they've pulled before, saying air bags would make cars unaffordable to most people. Automakers have shown a puzzling reluctance to make improvements in their cars that Americans want — safety features, fuel economy, etc. — and their reluctance has allowed foreign car makers to grab a large piece of the American auto market. So the automakers came out against the Open Fuel Standard Act. Too bad. Seat belts were mandated against their wishes too, and have saved countless lives. When the Open Fuel Standard Act is passed, it will save our economy from future oil shocks, and it may very well save lives as it cuts off funding to Islamic fundamentalists and strengthens our national security. Taxpayers helped the automakers recover from the last recession. Now they can help us prevent the next one. The Ultimate Flex Fuel Car Engine?